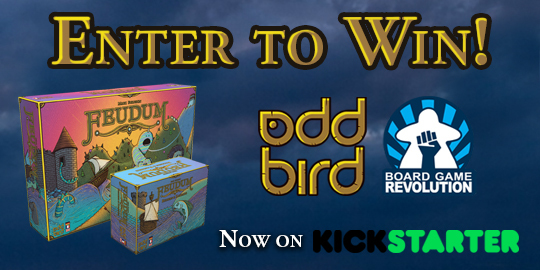 [Deadline to enter is 03/23/19 - 11pm pst] Prize includes : Feudum Base Game: Rudders and Ramparts Expansion; +All applicable stretch goals; *Free US shipping* ***You must be an active member of the Board Game Revolution Facebook Community to be eligible to win*** https://www.facebook.com/groups/boardgamerevolution/​ Please ensure you have completed an entry fully before closing out or hitting continue. The winner's submission will be verified to ensure that all options have been completed properly. ﻿Finally, don't feel obligated to complete all the entries. We offer a variety of options to keep it fair for those that choose not to use certain platforms. Remember it only takes one entry to win. Good luck and as always, Have fun!